In soft cotton jersey, this graphic tee offers two varsity-inspired looks in one. Size M has a 69.8 cm body length (front and back), a 45.7 cm shoulder, and a 50.8 cm chest. 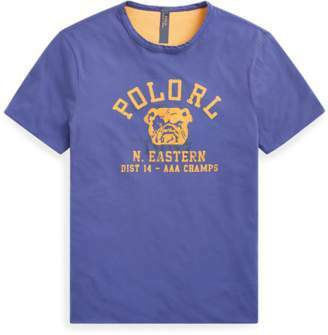 "Polo RL" and a bulldog printed at the centre front of one side. "Polo R.L. Est. 1967" and a crest printed at the left chest of the reverse side.